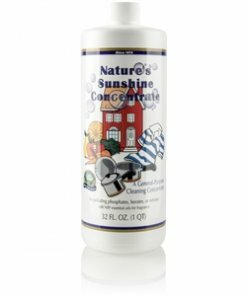 Nature’s Sunshine Sunshine Concentrate is an all-purpose, concentrated cleaner that is hard on dirt but safe for your family and the environment. This biodegradable formula is free of phosphates, borates, and acids. It works well to clean kitchen appliances, dishes, cooking ware, silverware, and even the walls and floors. It can be used in the dishwasher and to clean fresh produce. Additionally, it can be used as a laundry soap. It works as an all-purpose cleaner for windows, mirrors, bathroom appliances, tile, walls, and furniture. 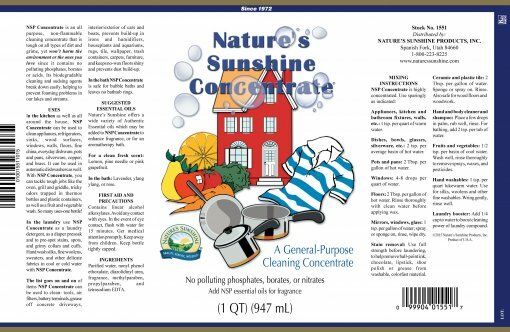 In the outdoors, Sunshine Concentrate is useful in cleaning tools, air filters, car or boat exteriors, and grease on pavement. It also works as a pet shampoo, insect repellant, or leather-cleaner. Sunshine Concentrate Cleaner has a skin-safe pH level of 6.5, unlike most soaps with a pH of 6 or more. One concentrated bottle is equivalent to 200 gallons of regular window cleaner or 64 gallons of other household cleaners.